Oh you guys! It kind of saddens me to write this post because that means my weekend in Denver is officially OVER! It was so much fun, and I hope you are enjoying the recaps as much as I enjoyed living it in real life. If you missed the first part of this - you can read it HERE. On Sunday, I parted with the Style and Beauty board girls for a blogger meet up. Kellie and Stacie from ie-Style are Colorado locals and were nice enough to pick me up from the hotel for a lunch and shopping date! 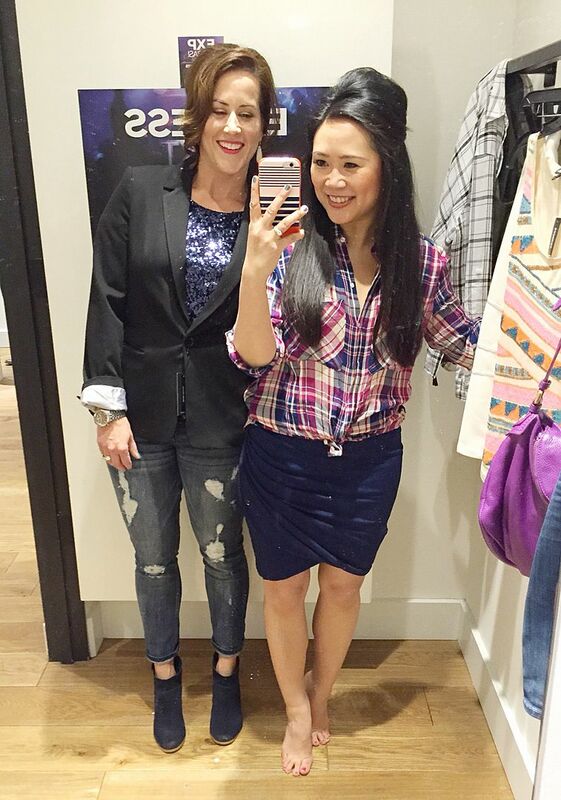 Seriously, the pressure to dress for other fashionistas is a struggle! However, I felt a little bad because by this part of the trip, my body was beat down, I was super tired, and feeling very fashion un-motivated. I ended up just recycling bits from earlier in the trip. The original plan was that we were going to eat lunch at Cherry Creek - this restaurant called Syrup. Looks amazing, right? Wellll, unfortunately, timing didn't work out. We probably should have gone earlier, but I just knew that Saturday would be a rough night for me and was wary to commit to anything earlier than hotel checkout! The wait was about 45 minutes, which, to be honest, didn't surprise us, but we ended up just taking our chances to see what the mall had to offer in terms of food. On sale now for $19.90! I'm not the only one that does the enabling though! Gina has this jacket (see it here) and I swoon over it every. single. time. she wears it. I figured it was about time for me to just get my own so that I didn't have to worry about the regret of missing out!! I tried it on with this Zig zag aztec embellished tank, and while I did love the tank a lot as well, I went ahead and passed for now, mainly due to limited suitcase space. Since the jacket has been out for awhile, I feared for its availability, so I snagged my size and figured I could *make* room for it in the suitcase. 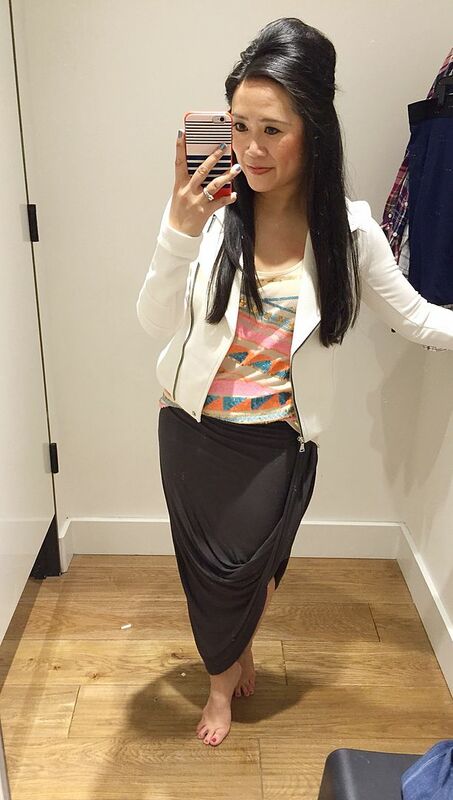 I was intrigued by this skirt. Unfortunately, it's not online right now, though this one here looks like the same principle. I'm not sure how I felt about it on me, and since it was something I didn't LOVE right away, I passed on it. I LOVED however, how it looked on Kellie in black! Maybe it's the way I'm standing, but I like the way her leg gets more exposure, and the fit is very flattering on her. 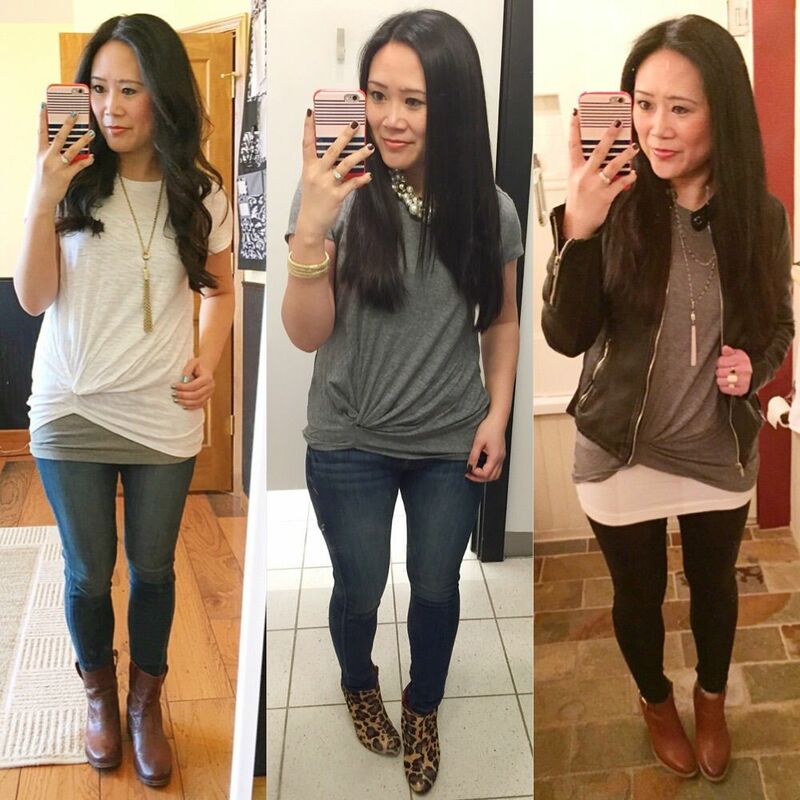 I also kinda dig the whole asymmetry going on with the same knotted tee! 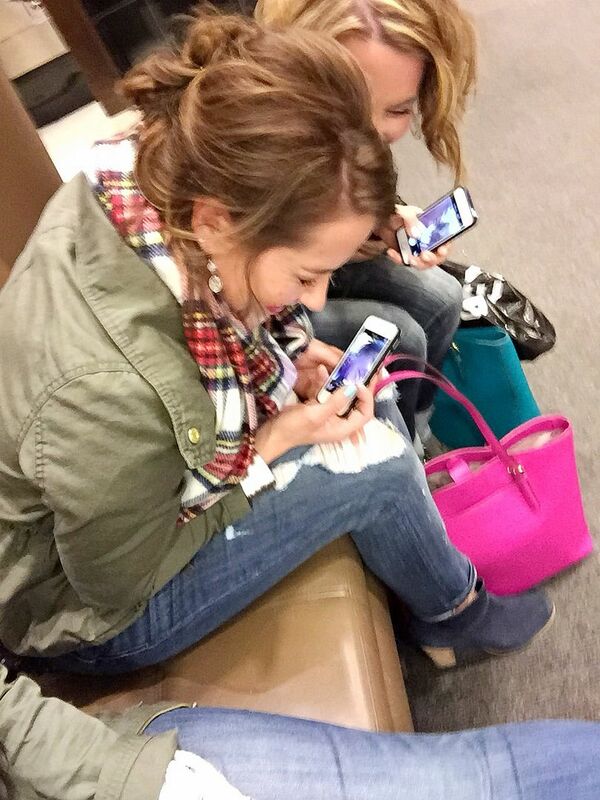 I was showing Kellie how I take mirrored selfies. Haha. But as far as what we are trying on - she realized she didn't have a structured blazer and I put in a good word for this one. 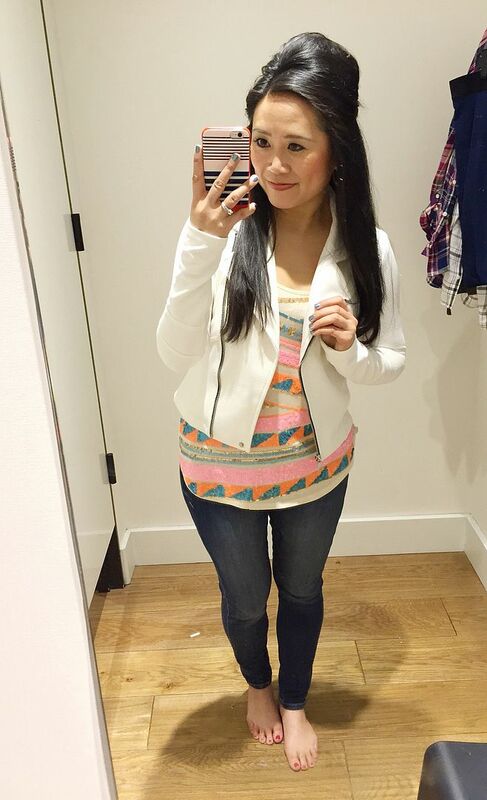 You can actually read all about her fitting room endeavors here! I saw this plaid shirt on Rachelle here. Ironically, she was headed to Express to buy this plaid top of mine, and ended up walking out with hers instead. And when she texted it to me, well, that made me want it, too! Wouldn't it be easier if we all just shared one closet?! This is the same shirt as the one I physically wore to shop, just in a different color. And since I have this top in 3 colors already, I couldn't not get a fourth one. RIGHT? I didn't get the blue marled mini. Yet. I did love it, just as much as my grey and black ones, but I ended up only walking out with the moto jacket and the plaid top! After all of that, we kind of lost the mood to try on more clothes! I know, blasphemy, but that's the downside to shopping during the winter. All the layers! So, we opted to go shoe shopping instead, and you know my favorite place for that, right?! Nordies! Admittedly, I was long overdue for a pedicure and managed to squeeze one in right before this trip. That made me extra excited to shop for sandals, not to mention the fact that I have spring fever like crazy! I fell in love with these cognac strappies! The block heel makes them easy to walk in, and the straps don't dig at all into my feet! Very comfy! I loved these Joe's pumps, but unfortunately they didn't have my size. As good sales associates do, Max was nice enough to bring out an alternate option. Similar color, but obviously more of just a basic pump. I fell in love with them immediately! The shape was perfect and they were really easy to walk in! I don't have any other pumps in this color, so I was definitely down to bring them home with me. But, that's the problem. How on earth do I take two pairs of shoes with me without having to check a bag? Easy! Just ask Nordstrom to ship them to you, which they will gladly do free of charge. Win/ freaking win. At the end of our date, Kellie asked me to walk them through my selfies, so we practiced outside of the Nordstrom bathrooms. I can only imagine what people were thinking! I'm not kidding when I say their laughs are contagious! 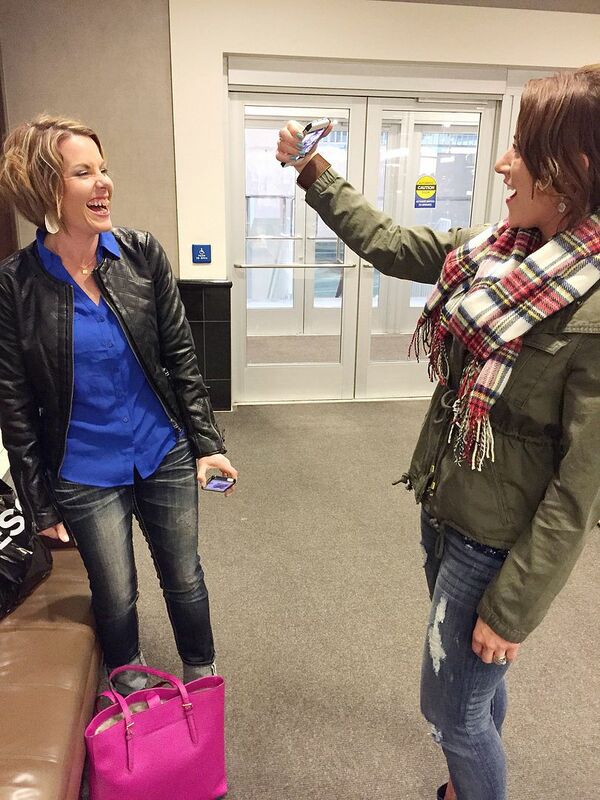 Kellie and Stacie were the nicest, sweetest, most beautiful people - inside and out! I couldn't help but sneak some photos of these girls laughing it up! Makes me smile just looking at these! So thankful to share my day with these two lovelies! What a great ending to an already fabulous weekend! I hope you will pop over to their blog here and say hello! 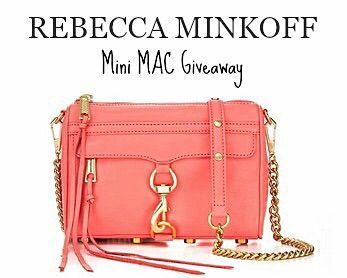 Still time to enter the Rebecca Minkoff Mini MAC Giveaway! I love this joe pump as well and would love to try it on. I love the jacket you and Gina have but it didn't look as good on me. 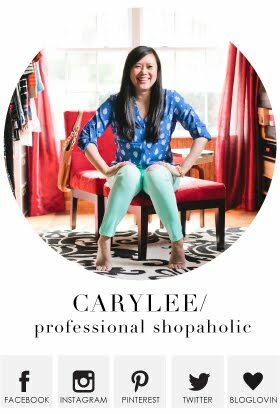 Great recap I cannot wait for us to have lunch one day and go shopping. 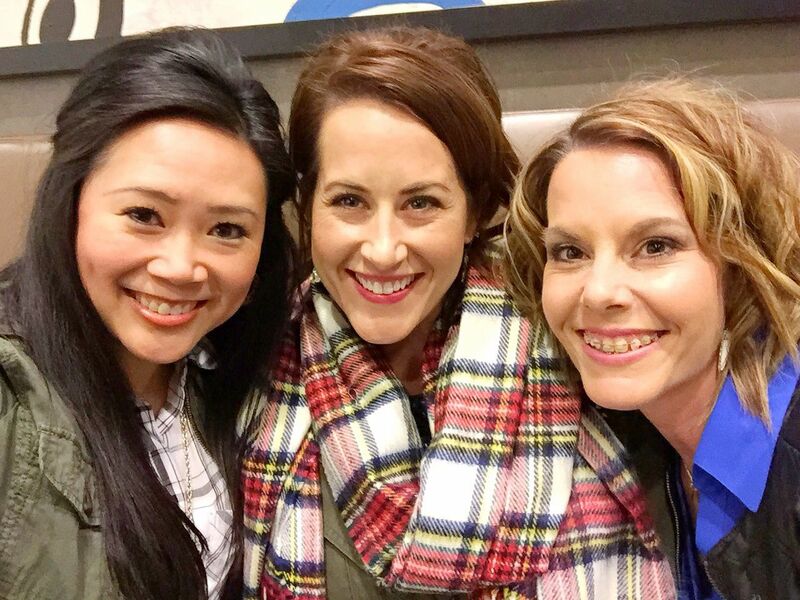 Could Kellie and Stacie BE any prettier? [/chandler bing]. I'm simultaneously so happy for you guys and having second hand enjoyment over your awesome lunch and shopping and also totally jealous!! And you do seem to have a pattern with your dates...hm. 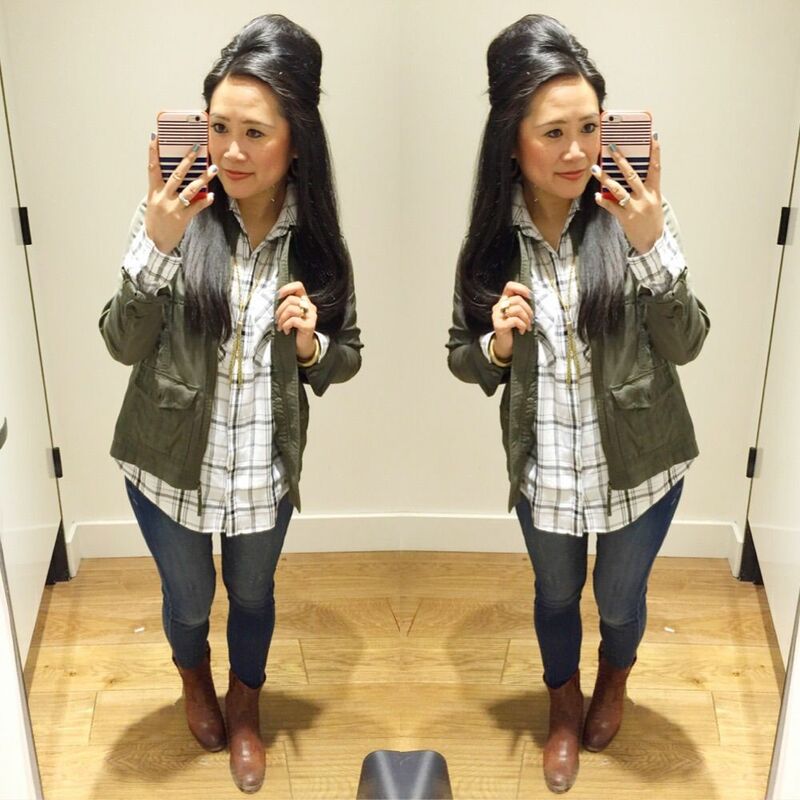 SO glad you got that jacket and it looked amazing in your IG pic. I will 100% be copying that outfit! What a FUN shopping trip!! Getting a pedi right before sandals shopping is the best idea! Oh, where to start?!? Fun recap!! Oh, that moto jacket!!! If I hadn't already filled my arms with what I did buy, I would have looked at the textured motos, but I knew better than to tempt myself!! However, both you and Gina make a very strong case for that jacket, and after seeing it in person, I know it will be a purchase I'll have to make at some point! I know we said this already, but both of the shoes you got are just FAB!! The pics don't do the color justice on those pumps...I hope you're loving them just as much now that you have them home! Thanks for the "love' in this post...the laughing pics are making me chuckle!! So glad this worked out and we'll have to do it again without question!!! How fun you got to meet up with them on your trip! Whenever I go to a blogger event I am so stressed about what to wea. Nothing ever seems fashion-y enough haha! OH I LOVE your posts. I'm always inspired to dress nicer after reading your latest post. It looks like you had a lot of fun! Love what you bought! The more posts you share the more fun the trip looks! I love the white moto jacket and those Dolce Vita sandals! 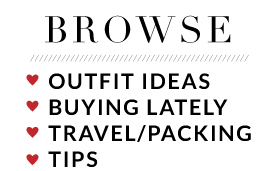 Those are two items I am always on the lookout for- a white jacket and tan block heeled sandals. Thanks for sharing these! 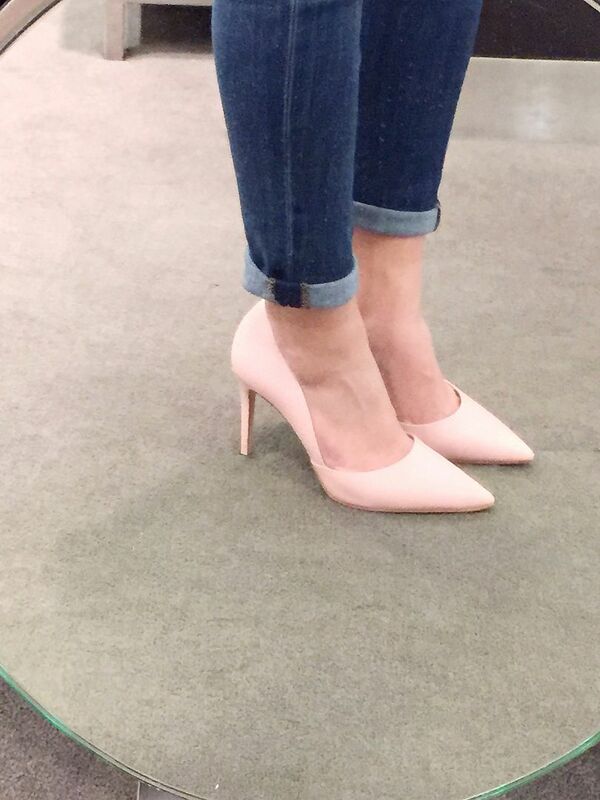 I love those blush/pink pumps! Looks like you had a wonderful time! !